T-mobile is set to unveil it’s plans for the beginning of 2014, and promises to start the year with a bang. Invites have been sent out to members of the press confirming that the Uncarrier 4.0 announcement will take place on January 8th, at CES in Las Vegas. We’ve heard that it could be a plan to help customers break their ties with existing carriers. I wrote a piece on it earlier today, speculating – based on a tipster’s information – that Tmo is set to start helping customers to pay their early termination fees to other carriers. Although that’s a rumor for now, it won’t be long until we find out exactly what Legere&Co has planned for the network operator next year. “This one you aren’t gonna believe” certainly sounds promising, and I was skeptical about the ETF payout scheme, so maybe the two do line up. At CES? It may be that plus LTE Advanced or an increase in speed. It has to be electronics related. They used to show off new networks there. John has been chomping at the bit to say he has the fastest network. So I agree this will probably be a network related announcement. Grammar booboo: its*, not it’s. Did TmoNews get an invite? I’m still trying to find a way to get into the event. True but Cam has far less grammar mishaps then David did. One out of four articles had some kind of grammar problem. It would be nice if John invested in faster servers. Waiting 30+ seconds for the T-Mobile My App to retrieve account data is a constant annoyance. The main attraction will be more than likely about ETF credits, with some mention on improved LTE coverage, speeds, etc. Didn’t they announce abolishment of contracts at this year’s CES? Seems like a good place to shake things up some more :D.
It would be nice.. But not everyone in 2G areas has an LTE device, so they would need to run them parallel, which presents a spectrum issue. Also, the back haul would need to be increased. Well how about HSPA+ that’d be just as good, I’m just over having my phone being on Edge all the time at home. I hope you get better speeds soon my friend! Still run into the problem of spectrum. That is if they only have spectrum for 2g then they will have to degrade that network to offer enough refarmed spectrum to run a reliable HSPA+ network. That could leave areas with crappy HSPA+ and a crappy 2g network to fall back on. It may be better to stick with a 2g network that at least works if the Frankenstein one is shoddy. They can remain quiet about the coverage issue but they can’t deny it doesn’t exist. As soon as they can make improvements it will happen. This is their weak point and everyone (you, me, readers here, At&t/Verizon/Sprint, FCC, Tech. reviewers, etc) knows it. Maybe not all 2G towers but maybe only the ones that have enough spectrum to support HSPA+ and maybe LTE. There are plenty of areas that that are 2G only that have sufficient spectrum. With that said, what about they do this, in secret, next year and turn it on all at once ether on Christmas day 2014 or as the ball drops on 2014 and 2015 begins. Maybe by then T-Mobile will have even more spectrum to deploy on. My Wishlist would be to increase the 5 line limit. I need at least 6. Upgrade all the crappy 2G? Though years ago they did do this..
depends on the number lines on the account. It starts selling 1/19. Can you clarify, please? I’m on a family plan and one line already has JUMP! Well you can still get JUMP on a single line but for families with more lines you can get a family jump option for $25. So all lines get JUMP without all having to pay $10/line. You have a shared pool of upgrades to split accross the account. This is one “anonymous comment rumor” I very much hope turns out to be true. Not holding my breath though. 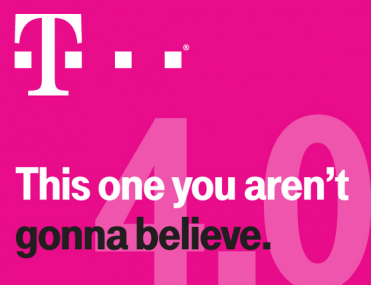 last year’s CES was the preview of what has become the comeback year for T-Mo. it comes full circle jan. 8. i am hoping coverage issues will be answered this time. we’ve been waiting for them to announce the upgrade of the rest of their 2G towers to at least HSPA+ for the 4th time now. it’s not funny to have pockets of no service or 2G in a heavily populated area in a big city like where i am now. If it’s covering ETF’s for new customers switching from their competitors that is great from a market share view but does not mean squat to me and I’m sure to others as well. Although means a lot to the competitors, what most people are more interested in as has been said below is additional expansion of coverage, acquisition of low band spectrum, roll out of 4G/LTE to urban and rural areas, conversion of 2G to at least HSPA+. That will brighten may day and in the long term will benefit everyone. I’m really just hoping for an announcement on rural expansion. I’ll amputate my toes if that’s what it is. It is not going to be that, I’m afraid.